Kaitlyn Goforth, Clairemont’s wonderful intern, explores the importance of responding to your customers and maintaining a dialogue on social media. As a PR agency, we manage social media strategies for a variety of clients. Effective social media demands careful attention, especially for restaurants where repeat business relies on word-of-mouth reviews. When an organization posts something on social media, it bares itself to criticism, praise and everything in between. In many cases, customers can reply to posts unrestricted, making social media a proverbial minefield to navigate. In general, restaurants can respond to a social media comment in five ways: by ignoring it, deleting it, defending themselves, issuing an apology or apologizing and offering a solution. Obviously, the last option is often the strongest strategy, but that doesn’t always happen in the restaurant business. Large chains receive thousands of tweets a day, and small companies often don’t have the manpower to consistently manage social media accounts. However, restaurants cannot afford to ignore social media’s burgeoning clout anymore, especially with trends such as the “eat and tweet” movement. So what does creative conversation with a restaurant look like? To answer that question objectively, we took a look at three brands that are not Clairemont clients. 1. Chipotle – This popular “fast-casual” chain has a three-person social media team that responds to almost all social media comments individually. Joe, Rusty and Myra sign their names after they have responded to “humanize” and personalize conversation. In addition, Chipotle uses social media as a way to communicate internally and regularly congratulates employees on promotions and jobs well done. It’s not just a burrito store; it’s a supportive family. To Shankman’s surprise, a Morton’s employee was waiting for him at Newark Airport with a to-go bag full of steak, shrimp and all the fixings. Shankman immediately tweeted a photo to announce the yummy surprise. 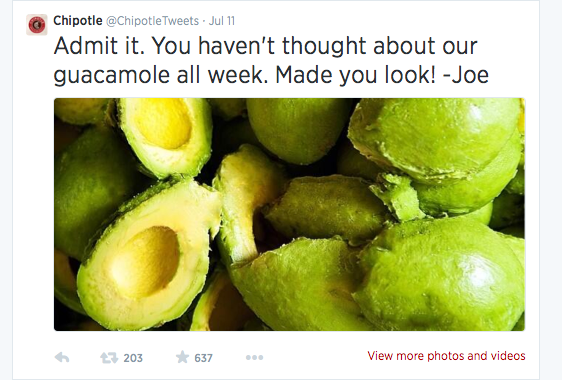 Chipotle, Morton’s and Starbucks are all setting a great example about how restaurants and other similar companies can turn tepid tweeters into life-long fans. 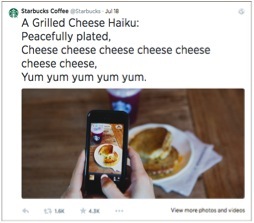 How does your favorite restaurant use social media to engage with customers?